Christmas Eve is probably my favorite day of the entire year. Growing up, I would spend the day before Christmas following my grandmother from the market to pick up seafood, to the bakery for a ‘happy birthday Jesus’ cake, and to the flower shop for fresh decor. I love the feeling of prepping for an evening of hosting with festive food and cozy homemaking. Simple touches of greenery, sheepskins, wooden accents, and twinkling candles make your guests feel welcome the second they walk into your home. A grazing-style menu is always my go-to for holiday parties. For this party, I set up a ‘toast bar’ with our Smeg toaster, crusty slices of sourdough, and a spread of toppings. Baked Brie is always a crowd-pleaser and takes minimal effort to throw together! Just place a round of french brie on an oven-safe plate, top with raw honey, walnuts, and a sprinkle of nutmeg. Bake at 350 for 8-10 minutes or until the top is golden brown. We love eating it with these whole grain raincoast crisps. I designed + printed food labels on recycled cardstock so everyone can find what they fancy. For allergy- friendly treats, I labeled the gluten free, vegan plate with a tag that read ‘Nice Treats’ and the traditional sweets with a ‘Naughty Treats’ tag. Click here to download and print them out for your own festivities! This wreath is easy to make at home, using an embroidery hoop as the base and two bouquets of fresh greens from Whole Foods. Arrange the greens to cover the hoop and attach by wrapping floral wire around each piece. Tie a silk ribbon around the top and hang on an interior door for an extra touch of freshness! 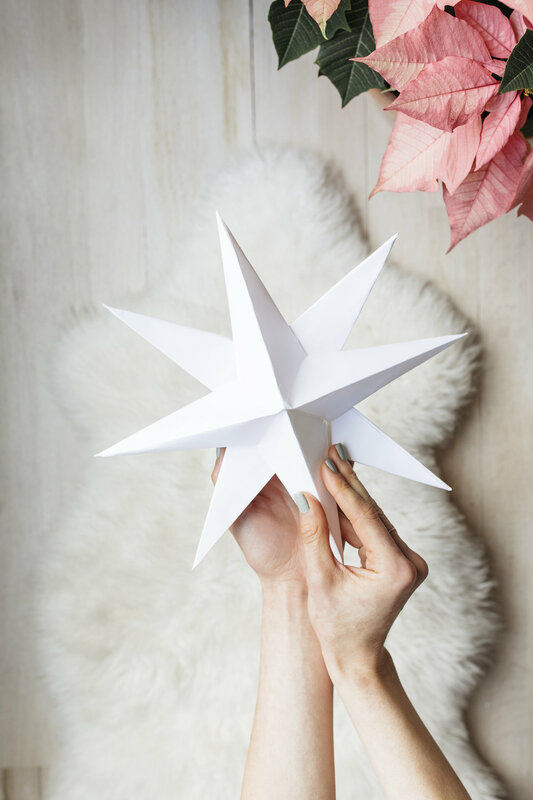 Inspired by the warm minimalist interiors found in Scandinavia this time of year, I hung DIY paper stars above our dining table. Placing eucalyptus and fresh pine in vases around your table not only looks pretty, but will fill your house with that scent that only comes at Christmas. 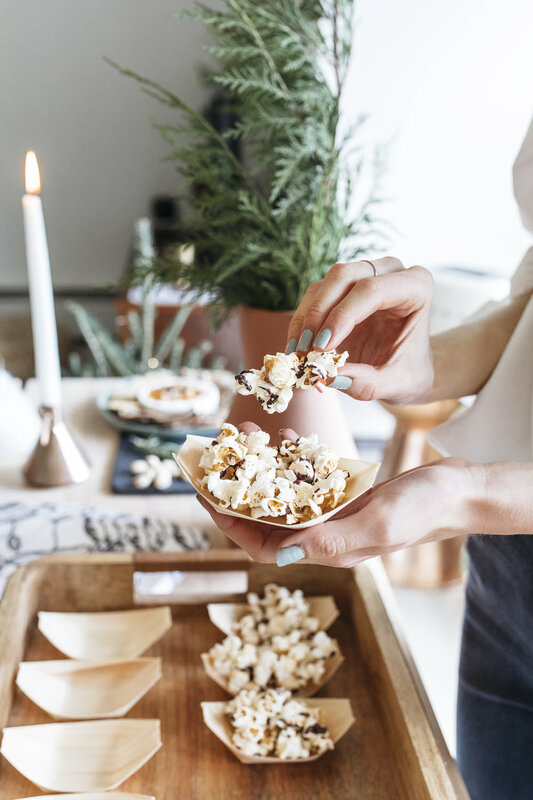 For an easy sweet ‘n salty snack, take a bag of light kettle corn and spread out in a single layer on a baking tray lined with parchment. Warm half a bar of organic dark chocolate in the microwave or over low heat on a double boiler. Stir once melted and drizzle over the popcorn. Crush a few candy canes and toss over the chocolate before it cools. Serve in these little bamboo boats! Merry Christmas friends! I’m so grateful for each one of you who check back on this blog every week. Hearing your stories and connecting through a skincare hack or healthy recipe brings me excitement to keep fresh content coming in the New Year. Thank you for your love + support!